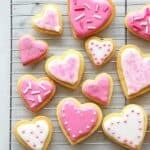 Valentine’s Day Heart Sugar Cookies – the perfect basic cut out sugar cookies recipe and easy icing. 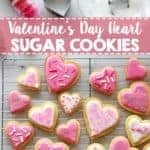 Great for Valentine’s Day, or any other day! 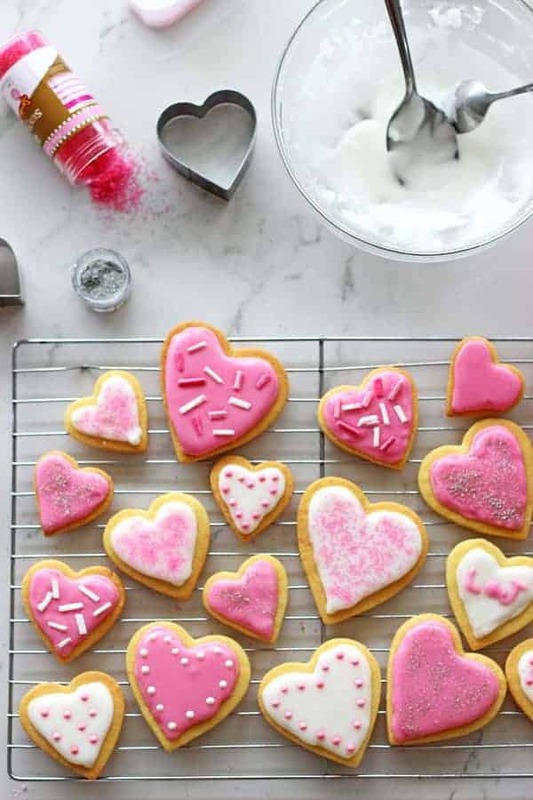 So we’re not really ones for Valentine’s Day but when it’s a rainy summer day and Josh is away for the night, clearly making and decorating heart shaped sugar cookies is top of my priority list. Along with finally 6 months later finishing painting the lounge! YAY! I’ve even managed in my ever increasing pregnant state to move the couch and coffee table back to their rightful spot in front of the TV so that I have somewhere to sit and eat my breakfast again! Yippee! All that’s left to do is put down some new carpet and then we have a brand new room! The only downside to how awesome our lounge looks now, is how terrible it makes our kitchen look in comparison. Gah! It’s never ending! But now we can actually get onto the most important room of the house currently…the soon to be baby room! Cue extreme panic. And did I mention how easy they are to make? The cookie dough comes together in 10 minutes and makes enough for about 45 cookies. I usually split the dough and freeze half of it for the next time that I suddenly feel like making cut out cookies! Think themed birthday parties, Christmas, Easter? Are we thinking about that yet? Um, no. But when you do, these cookies will be perfect! The icing is super easy. Icing sugar, milk and a bit of sugar syrup to give the icing that glossy look when it sets. 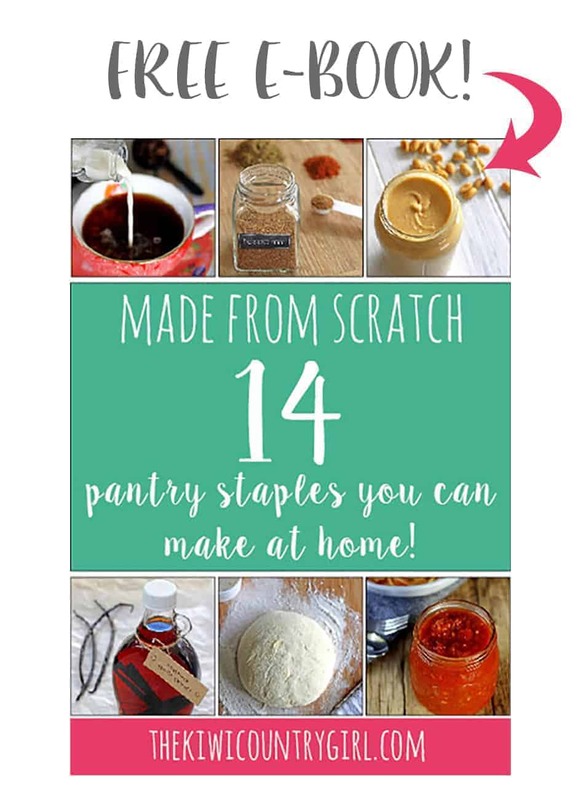 The sugar syrup is easy – equal parts sugar and water in a bowl in the microwave or in a pot on the stove until it boils and the sugar dissolves. When it comes to decorating the sky is the limit. You can make the icing any colour you like but clearly pink and white are the colours of the day today. I like using a piping bag with the smallest cut in the end to pipe the icing around the edges of the cookies. If you don’t have a piping bag, use a snaplock bag – it will work exactly the same way. 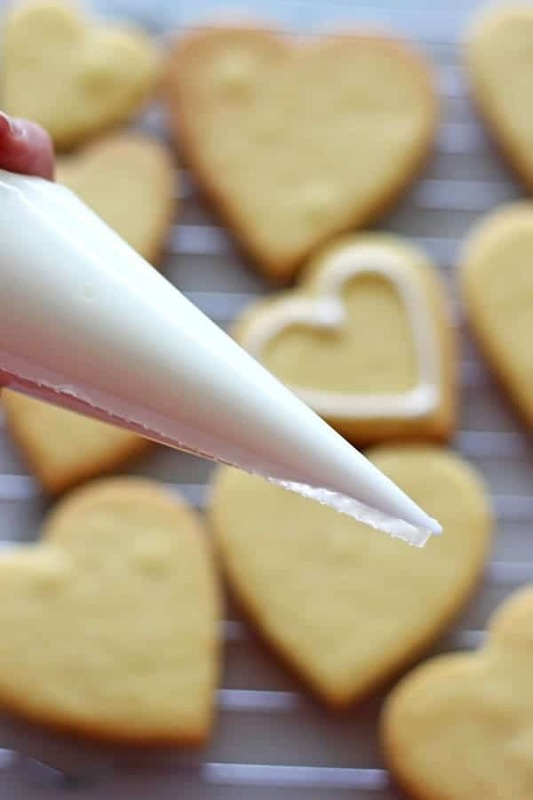 You can then spread the icing in using a spoon or knife, but piping it first helps you keep nice straight lines and makes a bit of a border around the edges. Then decorate using any sorts of sprinkles or edible glitter you can find. 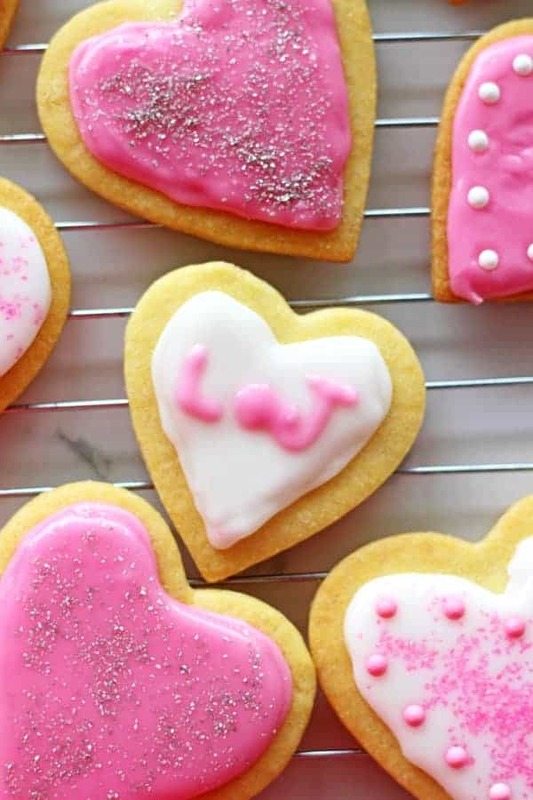 You can even follow suit and use the other colour to pipe cute messages onto the cookies – clearly I need a little practice – it’s supposed to be L + J…but cuuuuuute! 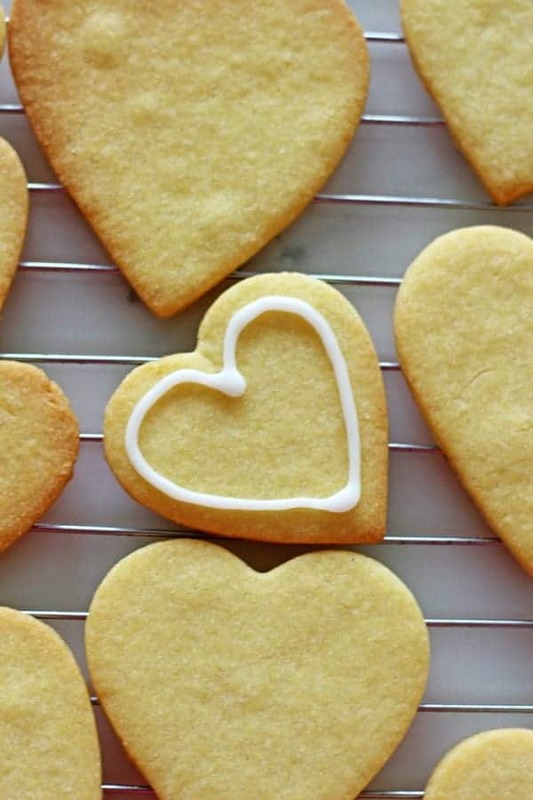 These definitely don’t have to be for Valentine’s Day, and if you don’t have a Valentine, make them for your mum, your Granny or your workmates! Or you know, yourself! *To make sugar syrup mix together 3 TBSP white sugar and 3 TBSP hot water in a microwave jug or small pot on the stove and bring to the boil until sugar is dissolved. Allow to cool slightly before using. Cream butter & sugar in the bowl of a stand mixer, or using a hand mixer on high speed until light & fluffy. Add the egg and vanilla and beat until well combined. Add flour, baking powder & salt and mix in well. Split dough in half and flatten into a disc. 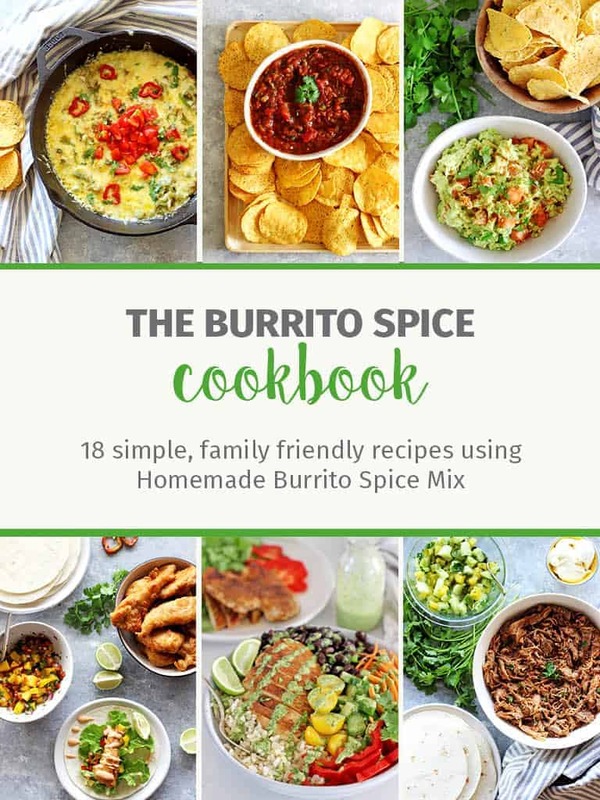 Wrap in plastic wrap and chill in the fridge for at least 30 minutes. At this point, you can also put half the dough in the freezer for another time. Remove the cookie dough from the fridge and roll it out so that it is about 1/2 cm thick. 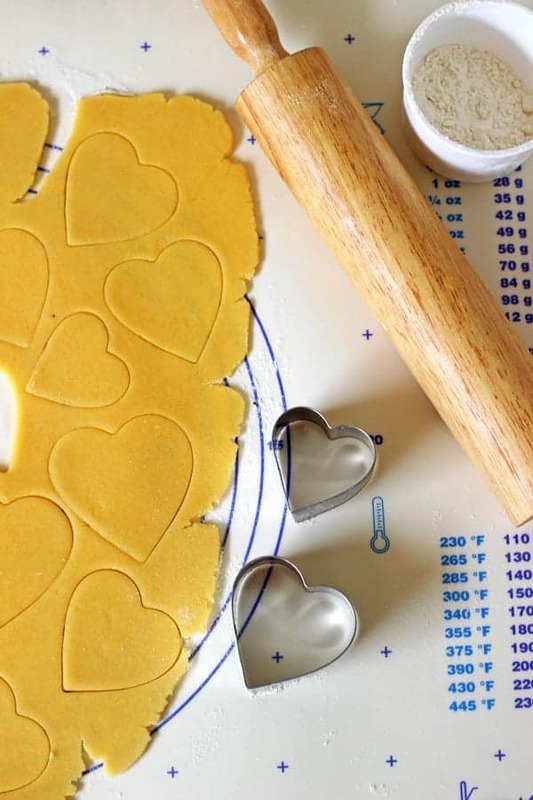 Using a heart shaped cookie cutter, assorted sizes if you like, cut out as many cookies as you can and lay out on a lined baking tray. Re-roll the leftover dough to make more cookies. Bake for 8-10 minutes until the cookies are just starting to go golden on top. Remove from the oven and allow to cool for 10 minutes before transferring to a cooling rack. Mix together icing ingredients until smooth. Split into 2 bowls and colour 1 with a couple of drops of pink food colouring. Add a little more liquid if the icing is too thick. If using a piping bag, spoon the icing into the piping bag and snip off the end. Pipe around the edges of the cookies. 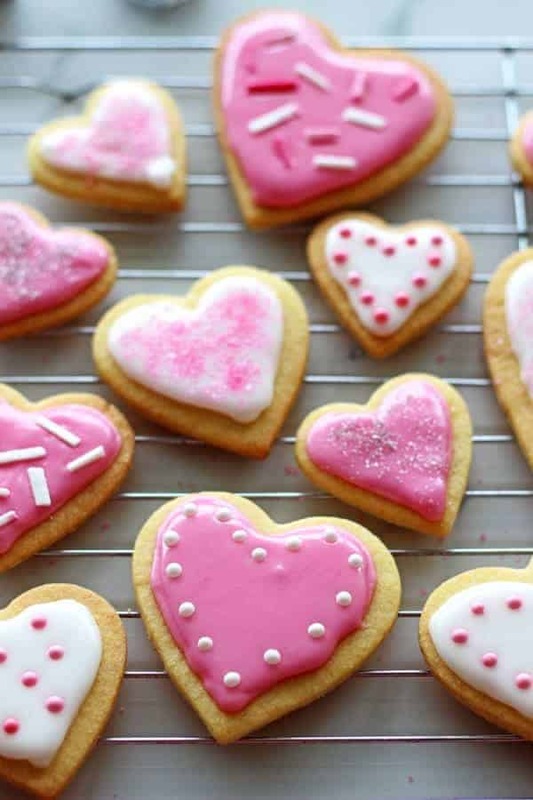 Fill in the rest of the cookies with icing, either using the piping bag or a spoon. Decorate with sprinkles and edible glitter. Allow cookies to set. Store in an airtight container at room temperature for 1 week.